+ ARRL Field Day: ARRL Field Day is This Weekend: Are You Ready? Tens of thousands of Amateur Radio operators will be firing up portable radio stations from unexpected locations this weekend for ARRL Field Day. On June 23-24, more than 35,000 hams are expected to operate from parks, malls, schools and. yes, fields, around the country. Field Day is the climax of the week-long Amateur Radio Week sponsored by the ARRL. As of June 19, more than 20 states and countless cities and towns have issued proclamations thanking and supporting the hams for their community service work. Looking for a Field Day location? Check out the Field Day Locator. Find information for media and the general public here. Find information for radio amateurs and participants here. Check the ARRL Facebook page and the ARRL Twitter feed throughout Field Day weekend for live updates. Stations active during ARRL Field Day -- June 23-24 -- are eligible to receive 100 bonus points for copying the special Field Day bulletin transmitted by W1AW (or K6KPH on the West Coast). You must include an accurate copy of the message in your Field Day submission. The Field Day bulletin must be copied via Amateur Radio; it will not be included in Internet bulletins sent out from Headquarters and will not be posted to Internet BBS sites. The Maritime Radio Historical Society's K6KPH will transmit the 2012 W1AW Field Day message for the benefit of West Coast stations on 3.5815, 7.0475, 14.0475, 18.0975 and 21.0675 MHz, CW only. The frequencies for K6KPH Digital (RTTY, BPSK31 MFSK16 and FEC AMTOR) will be 7.095 and 14.095 MHz. Click here for the complete schedule. 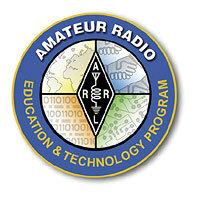 In June, the ARRL Executive Committee reviewed grant applications for the ARRL's Education & Technology Program (ETP), awarding equipment and resources valued at nearly $16,000 to 11 schools. More than 590 schools across the country have received support from the ETP in the form of grants for equipment, curriculum and resources, as well as teacher in-service training through the Teachers Institute on Wireless Technology. Applications for equipment and resource grants are accepted twice each year; application deadlines are May 1 and November 1. A central goal of the ETP is to develop a foundation of wireless technology literacy among America's teachers and students. It employs Amateur Radio to explore radio science and electronics and provide hands-on activities that engage students' minds and imaginations, opening doorways into math, science and technology curriculum topics, as well as other core curriculum areas such as geography and language arts. Read more here. 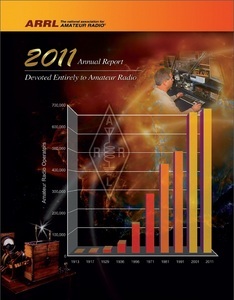 The ARRL Annual Report for 2011 -- now available online -- reviews the major events of the year and documents the renewed growth of both the ARRL and the activities of the Amateur Radio Service. For the fifth consecutive year, ARRL membership grew -- totaling 157,813 members at year end. According to ARRL Chief Executive Officer David Sumner, K1ZZ, Amateur Radio is flourishing: "Despite challenges on many fronts, Amateur Radio and the ARRL were in better shape at the end of 2011 than at the beginning. In September, we reached a milestone in amateur licensing, with 700,000 individuals licensed by the FCC, and reached 702,056 at the end of December, up .86 percent for the year." Sumner noted that ARRL membership also grew at .86 percent, exactly the same rate as the licensing numbers. "While membership is still short of its all-time high, we have achieved five straight years of growth, straight through the recession," he said. "This record of success is testimony to the professionalism of our membership staff as well as to the diligent efforts of everyone, volunteer and staff alike, who contributes every day to a positive image of the ARRL in the Amateur Radio community." Read more here. The new Amateur Extra class (Element 4) question pool -- released by the National Conference of Volunteer Examiner Coordinators (NCVEC) in January 2012 -- becomes effective on Sunday, July 1. The current Amateur Extra class pool expires on June 30, 2012 and cannot be used after that date. This new question pool -- including graphics and diagrams -- will remain valid until June 30, 2016. The new Amateur Extra pool contains 702 questions, from which 50 are selected for an Element 4 examination. As of June 13, three questions -- E1D09, E2A14 and E6E10 -- have been removed from the new pool. The current Technician class question pool that became effective July 1, 2010 is valid through June 30, 2014. The current General class pool that became effective July 1, 2011 is valid until June 30, 2015. 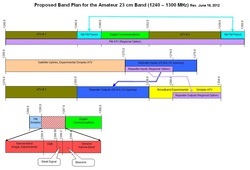 The ARRL UHF/Microwave Band Plan Committee has proposed a new 23 cm band plan. See a larger image of the proposed band plan here. 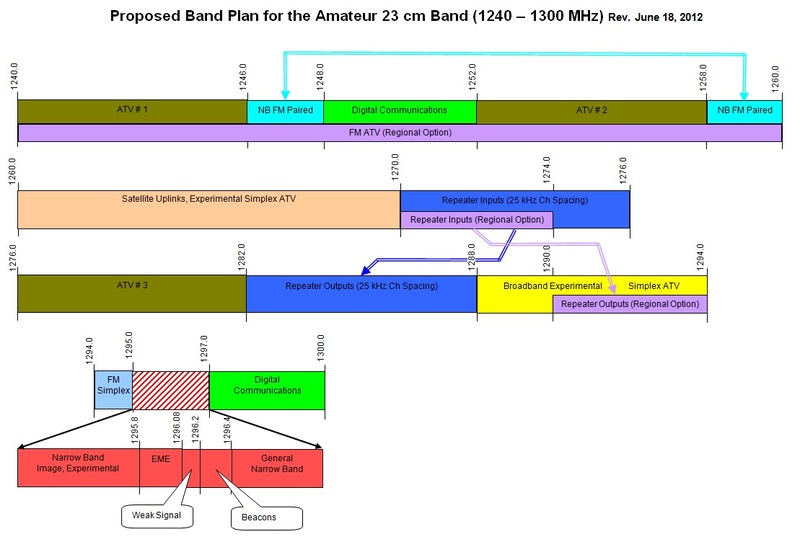 Last winter, the ARRL UHF/Microwave Band Plan Committee asked the Amateur Radio community about current, planned and projected uses of the Amateur bands between 902 MHz and 3.5 GHz. The excellent level of response provided us with the basis to complete drafts of the 9 cm, 13 cm and 33 cm revised band plans for ARRL Board approval. The Committee has now prepared for your consideration a draft band plan for 23 cm (1240-1300 MHz), the final band on its assigned list. Please look over the accompanying draft and let us know if you have any major concerns. Read more here. On June 18, the FCC issued an Order of Modification, modifying the license class of Todd Wilson, WH6DWF, of Honolulu, Hawaii, from General to Technician. 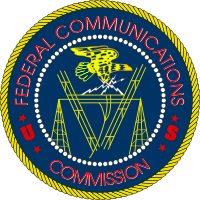 This stems from an Order Proposing Modification released in March 2012 where the FCC stated that granting General class Amateur Radio operator privileges to Wilson was "improper." Read more here. 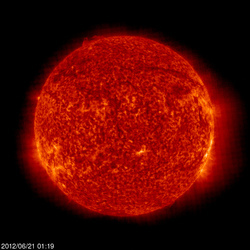 The Sun, as seen on Thursday, June 21, 2012, from NASA's SOHO Extreme Ultraviolet Imaging Telescope. This image was taken at 304 Angstrom; the bright material is at 60,000 to 80,000 Kelvin. Tad "It's brighter than sunshine" Cook, K7RA, reports: Sunspot numbers seemed to be in a free-fall this week: The average daily sunspot numbers declined more than 29 points to 87, while the average daily solar flux fell 6.2 points to 126.2. The outlook for Field Day weekend -- June 22-23 -- is for low sunspot numbers and quiet geomagnetic conditions. The predicted daily solar flux is just 90 for June 21-28, 125 on June 29-July 7, then 130, 135 and 140 on July 8-10, and then rising to 145 on July 11-12. The predicted planetary A index is 5 on June 21-29, then 8 on June 30, 15 on July 1-3, 8 on July 4-5, 5 on July 6-7, 8 on July 8-9, and back down to 5 on July 10-14. Look for more on the ARRL website on Friday, June 22. For more information concerning radio propagation, visit the ARRL Technical Information Service Propagation page. This week's "Tad Cookism" is brought to you by Aqualung's Brighter than Sunshine. Chris Stallkamp, W0ADZ, of Selby, South Dakota, has been appointed as the South Dakota Section Manager, effective June 15. 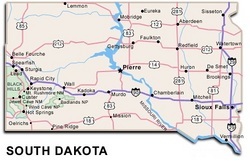 ARRL Membership and Volunteer Programs Manager Dave Patton, NN1N, made the appointment in consultation with Dakota Division Director Greg Widin, K0GW, and with the recommendation of outgoing South Dakota Section Manager Scott Rausch, WA0VKC. Rausch, of Piedmont, has served as South Dakota Section Manager since April 2009. He decided not to run for a new two-year term of office that was scheduled to begin on April 1. After a re-solicitation for nominations this spring did not result in any potential candidates, Stallkamp was then appointed to take the Section Manager reins from Rausch. Stallkamp's appointment extends until March 31, 2014. Stallkamp has been a radio amateur since 2006, and is a member of the Black Hills Amateur Radio Club. Interest in Amateur Radio runs in his family: Both his mother Margaret, KA0BEB, and father Lloyd, KA0ADZ, of Havre, Montana, are also licensed Amateur Radio operators.